Let’s Paint a Serene Landscape in Watercolors! When I saw this reference photo I thought it would be fun to showcase a few landscape techniques that anyone can learn. I had a few people on YouTube and Instagram doubt that they could paint this but I know you can. This video goes at a relaxed pace but if that’s too slow for you you can click on the gear on the YouTube player and speed me up (I don’t mind) or even slow me down or pause me if you want more time to practice a technique. If you like this painting please give it a try. You can do it! A viewer asked me “What is the difference between a beginner and advanced tutorial?” and for me it is about how it’s broken down and explained. If I did an advanced tutorial for this the pace would be quicker and probably involve more detail at the end. It reminds me of the question I get a lot “What subject is the easiest to paint?” I think the subject you are interested in is the best one to start with. If figures interest you paint people, if flowers interest you paint poises! You will learn quicker if the subject of you painting interests you. Nothing is harder than anything else subject wise and you can see all subjects painted effectively by artists of all levels so grab your paint and get started! Watercolor paper: Hahnemule Cezanne 140# CP paper *Also available at Cheap Joes, Hyatts and other art retailers. You ca use whatever paper you like but a 100% cotton watercolor paper will be easier to manage. Bee Watercolor Paper is a budget friendly option and I use it a lot for studies and sketches. The is the large palette I have is a PIKE palette. 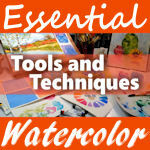 If you would like to lean more about watercolor consider enrolling in one of my online classes. *Use coupon code TRYME for 20% off. I will soon be starting on my next course and I am trying to decide between landscapes or animals so if you have a preference let me know in the comments below. Thank for stopping by and til next time happy crafting! Howdy friends! I got an interesting suggestion for a painting from a viewer named Jenny Recently and since I had not painted anything like it I decided to give it a try! She wanted me to paint a stack of rocks, also called a “cairn” which are used to mark trails for hikers and give directions. I learned all about them in Girl Scouts but sadly that was decades ago so I can’t elaborate LOL! I am lucky I never got lost in the woods hiking! Anyhow, I thought it would make a fine watercolor tutorial and I hope you do too! Paul Rubens watercolors *review coming soon! Rocks are some of my favorite subjects to paint, I love the colors, texture and character they have. I think it’s cool that they have been here for millions of years and how unique and yet how common they are. What do you think? Is it crazy to paint a stack of rocks? Let me know in the comments below and til next time happy crafting! Programming note: There will be no live show tomorrow. Yesterday’s Painting Adventure inspired Today’s Live Stream Project! I was up early to drop my daughter Maizy off at a team building exercise with her high school basketball team (high school? I can’t even!) and I debated whether or not to drive back home to work and then come back to Orono to pick her up. Originally I thought the ropes course they were doing was 2 hours so I grabbed my travel painting gear and took her to the course. When I got there I found out it was a 4 hour program so I was at a loss of what to do. When it was a 2 hour program spending an extra hour on the road (driving home then driving back) was wasting 50% of that time but with a 4 hour course I was only wasting 25% so I probably should go home and work. I’m so glad I didn’t “should” all over myself, instead I decided to drive around and see if I could find a nice spot to paint by the river. I sat here for 2 hours and did 3 sketches! I attempted the whole scene at first but was quickly overwhelmed by green so I decided to focus in on the rocks in the water. I love to paint rocks. Rocks are like the mason jars of nature, I can’t get enough. I zoomed in on these rocks with my phone. Believe me when I say your eyes can see way more details than your phone’s camera. Plus I love the sense of urgency you get when painting on location! I love the way the rocks came out and rocks are something people always mention having a hard time with so I thought we would tackle them today! 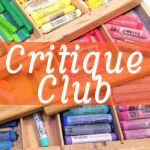 So bring your rock questions and your watercolors and let’s rock those rocks! Be sure to tune in at 12:30pm ET today (Friday 6/22/18) on YouTube to ask your questions to me and chat live with fellow painters. Watercolor: I’m using a Portable painter travel palette and Qor Watercolors in colors Quin Magenta, Cobalt Teal, Ultramarine, Diox. Violet, Sap Green, Raw Sienna, Burnt Sienna *I’m going to use my travel palette so you can see what I use when I am painting outdoors. And I sketched the mason jar lemon water they served as I waited for my meal. It was my first ever cafe sketch LOL! What a lovely way to pass the time when dining alone, it sure beats checking my phone which would make me feel a little guilty that I should be home working and not out having a lovely day but as I mentioned before I was not going to “should” all over myself today:) I strolled around downtown Orono after lunch but since I really didn’t want to shop I went back to the park for one more quick sketch before returning to pick up my daughter. My alarm to pick her up went off before I totally completed the sketch but luckily I got all of the details I needed in with black pen. I hope this post inspires you to paint rocks, or mason jars, or treat yourself to Thai food once in a while! Do something nice for yourself today! Oh! one more thing I wanted to mention there is just about a week left to save 50% on my new Watercolor Flower Workshop so if you are interested you might want to grab it before the price goes up on July 1st. 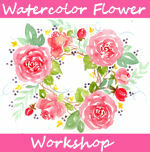 Use coupon code FLOWERPOWER if the discount does not appear automatically. Did you catch my 15 Watercolor Hacks (Cheap Supply Tips) Video this week? If not there was a coupon code to save 30% on any other class you have had your eye on. Use coupon code 15HACKS to save 30% on any course in my Teachable school! I hope to see you at 12:30pm Eastern Time for rocks in watercolor! Til then happy crafting! There will be a live show today, but what will we paint? Edited to add a picture of what we painting in the livestream. 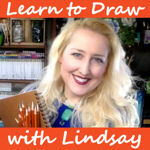 This is a good tutorial for beginners as there is no drawing. Have a great weekend! Hi friends! I have been out of sorts all week. I keep making creative project attempts but nothing is turning out, it feel like I am pushing against a brick wall. I can’t settle on what I want to paint today, I can’t even seem to decide whether to do the live stream upstairs in my office or down in my studio which may be warm enough to tolerate without the space heater running. I will have my regularly scheduled live stream at 12:30pm Eastern time today as scheduled because I am a big believer in forcing my way through a creative block rather than waiting for the muse to find me. That said next week is school vacation for my kids so I am going to take next friday off from live streaming. So if you enjoy the live shows better catch it today at 12:30pm ET! You can watch the live show or replay in the player below but if you want to chat live you will want to tune in at 12:30 on the you tube watch page. I did narrow down what I want to use because I had a neat little craft hack yesterday, I cut down the Dr PH Martin palette that my Mission gold watercolors are in to fit inside an extra QOR watercolor tin I had. That was my creative highpoint for the week I think. LOL! I will also use Arches watercolor paper and Creative Mark Mimik brushes but you can use whatever watercolor and paper you like. Here is the reference photo I used. I am pretty certain my creative funk has something to do with the eternal winter we are stuck in. We are supposed to have sunshine and upper 50s today (so I will get outside to try to soak up some good vibes and vitamin D) but then we will be plunged back into winter this weekend with 30 degree weather and snow/wintry mix in the forecast. I am so done with winter. Oh, well, this shall pass, hopefully by 12:30:) See you on YouTube! Happy crafting! LIVE! Loose & coloreful Sheep in Watercolor! 12:30pm Eastern Time Today! You can download a PDF printable pattern here of the sketch for today’s tutorial. If you want to chat with us you will need to watch the video on the YouTube watch page but I will record it and the video will be available in the player below as well! Also LifeBook 2017 begins in 2 weeks! Give yourself the gift of a year full of weekly art classes from 24 top-notch mixed media artists for the low price of $115 BUT WAIT use coupon code: FIREWORKS2017 to take an additional 20% off! That brings the basic course down to about $92 or only $1.77 a class! A year long class that costs less than a cup a coffee a week:) Nice! Other money saving bundles are available too, find out more here. See you on YouTube for this weeks live painting tutorial! Happy crafting! 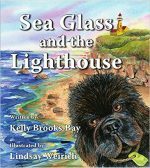 A Coastal Watercolor & Winner Announced! Hi friends! First today I want to announce the winner of the DIY Christmas Tree from Creativity Happens: mtmeade3 aka Reeah! 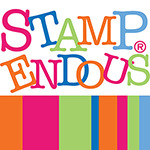 You will get an email shortly from creativity Happens so you can claim your prize. 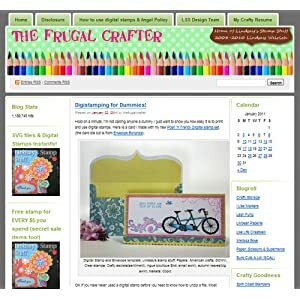 Don’t worry if you did not win, you can use the coupon thefrugalcrafter for 20% off your purchase at Creativity Happens so it is a great time to start your holiday shopping! Now, a watercolor from my trip! 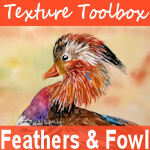 This is a beginner real-time tutorial so grab your brush and paint along with me! This is a scene from Acadia National Park in Winter Harbor Maine at Schoodic point. Follow along and paint with me in real-time! You can do it! Thanks for stopping by and til next time happy crafting! Live at 12:30pm ET, a Frosty Fall Landscape! Hi friends! Today we dive deep into color mixing and composition as we create a landscape in 3 colors. We will sketch the landscape together so no prep is needed for this free online watercolor class, just bring your supplies and join us at 12:30pm Eastern time on YouTube! Here is the photo we will paint from! You can watch the live stream or replay in the player below but if you want to chat with us or ask questions as we go you need to watch on the YouTube watch page. 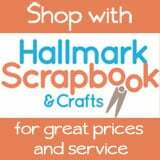 A big sale & a worthwhile cause at Craftsy! Brush up on crafting essentials and support breast cancer awareness! 5% of proceeds will be donated to the National Breast Cancer Foundation when you buy a class this weekend with my special affiliate link. All classes are under $20 and you get lifetime access so stock up today! Thank you for your support! 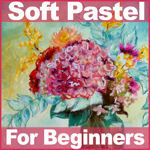 I hope to see you at 12:30pm, Eastern time today for a fun painting lesson! Til then Happy crafting & painting!